Java has operators for the standard mathematical operations. Note that + works a little differently depending on the type of the operands. Generally speaking, Java tries to evaluate your expression from left to right. However, some operations happen before others. Java follows a set of rules of precedence that should be familiar from Algebra class, abbreviated PEMDAS. ***Hint: Suppose you have 3 apples, and you distribute them among 16 people so that everyone gets the same number of (whole) apples. How many (whole) apples does each person get? How many apples do you have left over? The + operator does addition on numbers, but on Strings, it instead appends the two Strings together. System.out.println("Hello, World! ");         // prints: Hello, World! System.out.println("Hello, " + "World! ");    // prints: Hello, World! System.out.println("Numbers " + 2 + "! ");    // prints: Numbers 2! Note that only the whitespace inside the quotation marks is preserved. Using quotation marks tells Java to keep track of every character from the opening " to the closing ", including the whitespaces like spaces, tabs, and newlines. Outside the quotes, we're back in the Java program itself, where Java doesn't notice or care about the newline we've used to format the long line of source code. We do String concatenation instead of addition if either of the operands are Strings. We only add the numbers together if both of them are numbers (not Strings). Java keeps track of the type of pieces of data in your program. It treats "4" (a String) differently than it treats 4 (a numerical value). Having the distinction is crucial for some tasks: if the computer always treated numerical Strings as numbers, then we wouldn't have a way to prepend an area code to the beginning of a phone number. // All are using the + on a String -- all perform concatenation. Note: Even though the + operator works differently on Strings, it still follows the same precedence rules. There is a method called System.out.print that is similar to System.out.println. They are different in that print doesn't add a "new line" (line break, '\n') character to the end of your output. Every time you call System.out.println() Java will add a "new line" character to your output. For each of the following for loops, write the output that would be produced by executing them. // Note the number/String concatenation here in the print(). // i is an int variable that holds onto a numerical value. // For which numerical values does i hold as the for loop executes? Make a table of "\", "! ", and "/" counts in the size 4 figure. Then, write a for loop to produce the size 4 figure. Finally, compare the loop tests for the size 4 and 7 figures, and write a for loop with a class constant that will produce a figure of any SIZE. 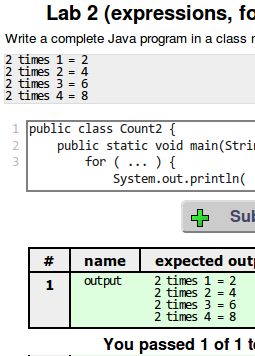 Test your code in the Output Comparison Tool or in PracticeIt!